I put meat in their hot cobbler pie. With a neat doughy topping piled high. 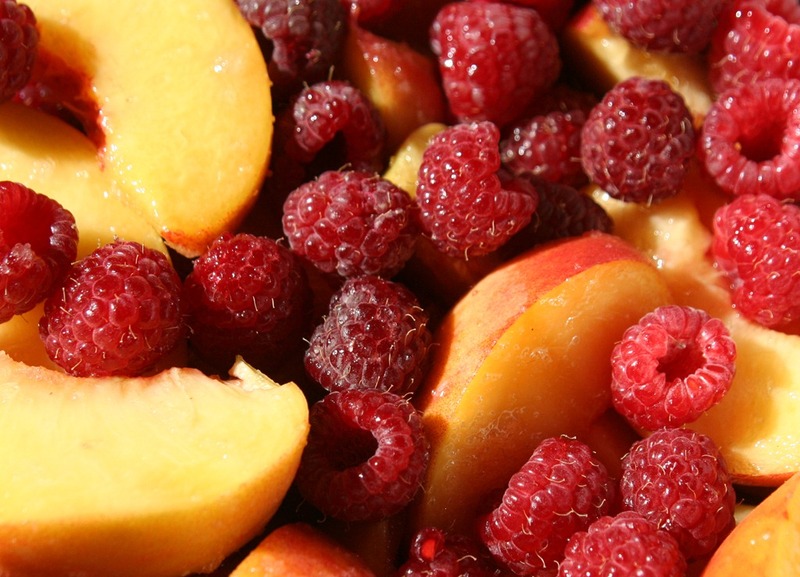 The peaches and raspberries are still impressing us with their bounty here at the farm. 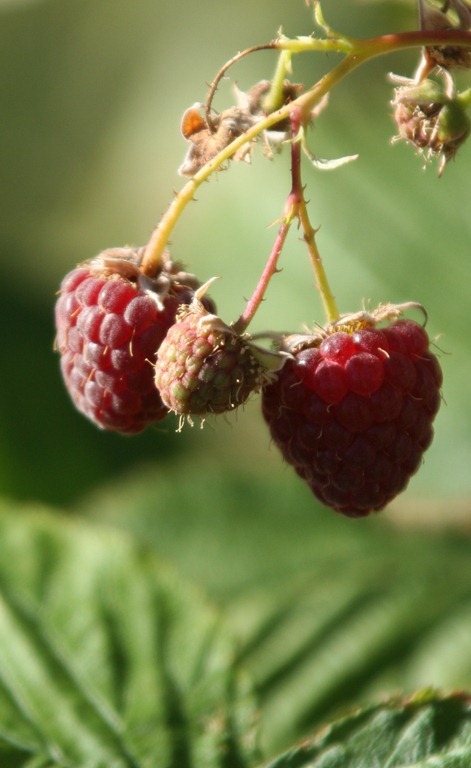 The raspberries are superb and with luck will continue until October. 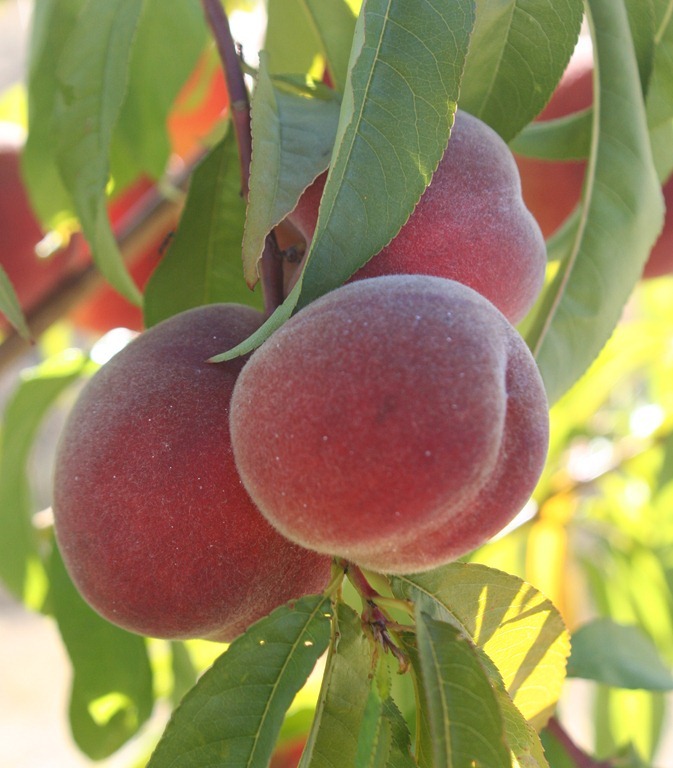 The peaches are close to being finished. Oh what a season! A cobbler can be either a fruit dessert or a savoury meat dish. Most of us, if we are familiar with cobblers at all, are more familiar with cobblers made with fruit. Cobblers belong to the realm of the Baked Dessert. There is the cobbler, the fruit dumpling, the roly-poly pudding, the puff pudding, the fruit grunt, the fruit slump, kuchens, and batter puddings. All consist of some fruit mixture with a biscuit dough topping. The difference between a cobbler and a grunt, for example, is the fruit in the grunt is cooked before the biscuit topping is dropped by the spoonful on the top of the hot fruit. 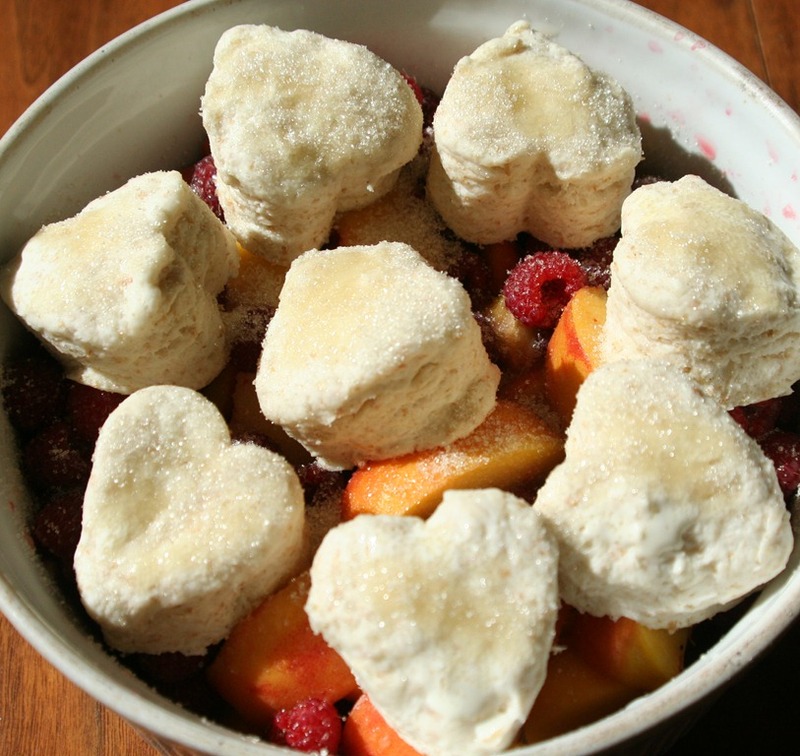 In the cobbler, the fruit is not cooked before the biscuit topping is added. A grunt and a slump are the same animal. Baked desserts are very flexible. Any fruit or combination thereof can be used. Use whatever fruit is available. Baked desserts are ideal when pressed for time or unexpected guests arrive. A simple meal of soup and bread is elevated from simple to exceptional. Baked desserts are meant to be put in the oven just prior to sitting down for dinner and consumed while warm. No other embellishments are required but a dollop of whipped cream or ice-cream would not go unappreciated. The biscuit topping is made with buttermilk, however, I often use yogurt when I don’t have any buttermilk. A sour milk product is used in doughs containing baking soda. 4 cups peaches, pitted and cut into eighths. 1. Preheat oven to 375F. Grease an 8 x 8 oven proof baking dish. I use a souffle dish. 2. In a large bowl combine sugar, corn starch and salt. Add peaches and mix together. Add raspberries and vinegar. 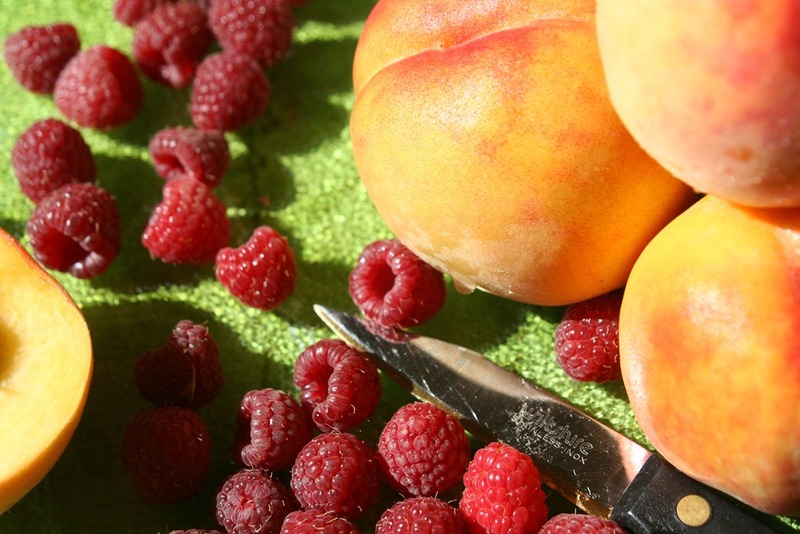 Don’t toss the peaches and raspberries. Carefully spoon into baking dish. 3. In a large mixing bowl combine flours, baking powder, salt and baking soda. Cut in shortening ( I use my hands) until it resembles coarse crumbs. 4. Add buttermilk to dry ingredients stirring with a fork until a soft dough forms. 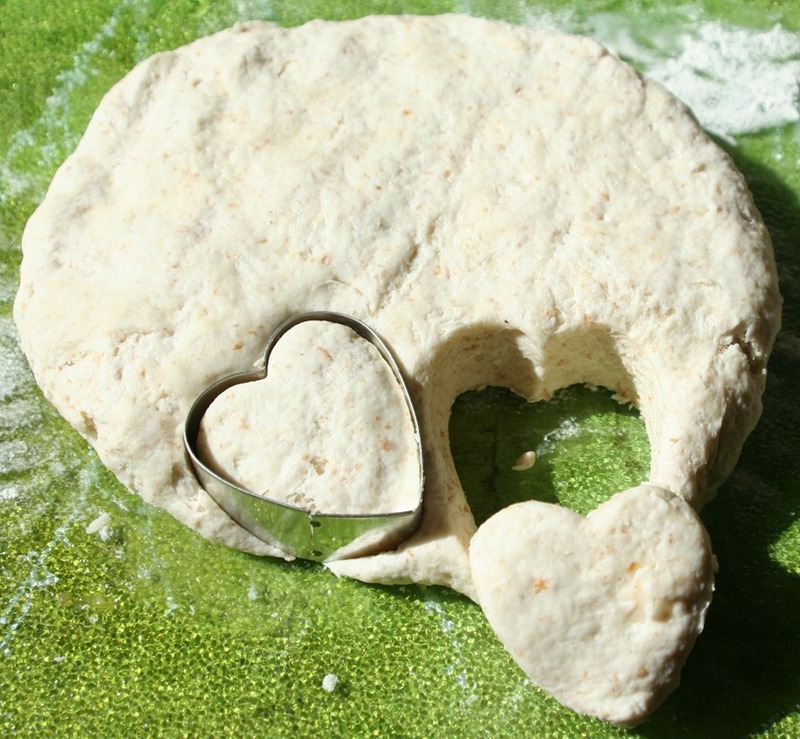 Turn dough onto a lightly floured surface and knead eight to ten times. Roll or pat into 1/2 inch thickness. Cut with your favourite cutter – I am using a 3 inch heart. If you don’t have any cookie cutters, use a 3 inch jar or cup for a circle. Place cut dough on peach raspberry mixture. Brush biscuit dough with cream and sprinkle with sugar. 5. Bake for 35 to 45 minutes. Serve warm. With whipped cream. Or not.